fashionflap54 | Fashionflap.com: Helping Online Shopping for Fashion! Shell: 100% Polyester.Lining: 100% Cotton.High Quality Material Jacket-Soft And Comfortable. Side pockets,Front button closure,Removable sash,Fully lined. 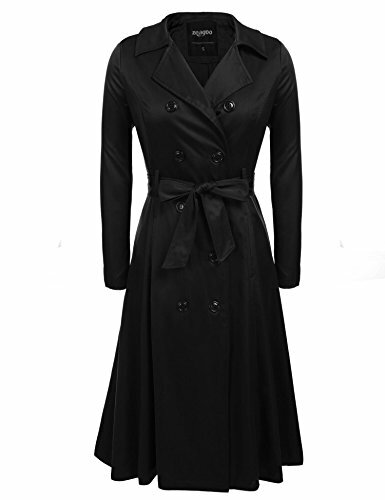 The sleek long trench coat features slim waist, with flare swing for a versatile look and fit, popular and fashion. A Beautiful Season Transition Trench Coat-It Is An Attractive And Functional Trench Coat Fit For Autumn and Winter Weather.Multifunctional Wearing Options-The Double-Breasted Long Trench Coat Great For Shopping,Office And Homecoming. Be The First To Know About The Secret Sales, Latest Deals, Style Update & More! © 2018 fashionflap.com. All rights reserved.